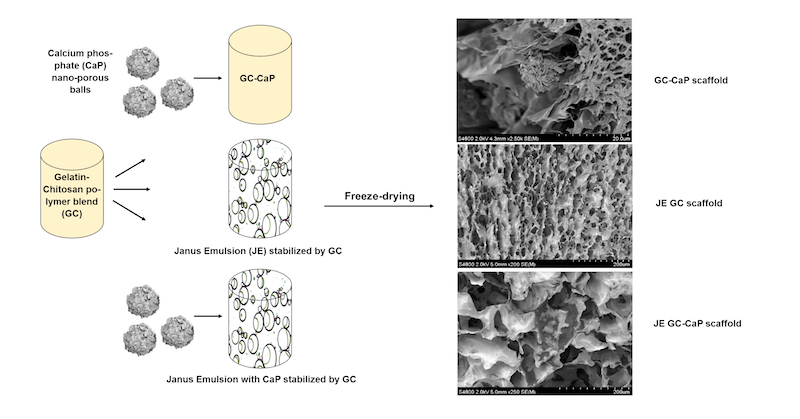 A three dimensional biopolymer network structure with incorporated nano-porous calcium phosphate (CaP) balls was fabricated by using gelatin-chitosan (GC) polymer blend and GC stabilized olive/silicone oil Janus emulsions, respectively. The emulsions were freeze-dried, and the oil droplets were washed out in order to prepare porous scaffolds with larger surface area. The morphology, pore size, chemical composition, thermal and swelling behavior was studied by Scanning Electron Microscopy (SEM), Fourier Transform Infrared Spectroscopy (FTIR) and micro-Differential Scanning Calorimetry (micro-DSC). Microscopic analysis confirmed that the pore size of the GC based sponges after freeze-drying may be drastically reduced by using Janus emulsions. Besides, the incorporation of nanoporous calcium phosphate balls is also lowering the pore size and enhancing thermal stability.